Are you ready to turn your girlfriend into your fiancee? Congratulations! Of course, deciding to take on this new and exciting milestone means lots of planning. Elaborate proposals are becoming more and more common. And while you don’t need to organize a flash mob, you will need to be prepared for the big moment. This means finding a special way to propose, knowing what you’ll say, and, of course, having the perfect ring to pop the question with. Right now, the idea of ring shopping may be a little nerve-wracking. But learning how to buy an engagement ring doesn’t have to be so hard. Do you want to know more? Keep reading to learn how you can choose the perfect ring for your soon-to-be fiancee. Your girlfriend is a special woman who deserves the world. You might be tempted to spend whatever it takes to find that ideal ring. However, it’s always better to create a budget. Jewelry stores often have a wide selection to choose from. Knowing your budget will prevent you from feeling overwhelmed as you can narrow your search down to rings you can comfortably afford. Also, keep in mind that you have a lot of big spending coming up. You’ll likely have to pay for your wedding (or part of it), your honeymoon, and possibly a first home. So, make sure you don’t spend your entire savings on an engagement ring. You can find a nice quality ring that she’ll love for a price within your budget. When it comes time to go shopping, you may walk into the first jewelry store you find. But this could lead to big problems down the line. You always want to research jewelers before you buy. Make sure they’re certified through the GIA (Gemological Institute of America) to ensure you’ll get a high-quality ring. Don’t forget to ask about insurance or a lifetime guarantee for your ring. The jeweler should be able to fix any problems with the ring, even if it’s 50 years down the line. Checking online reviews is a great way to see how their products and customer service hold up. The last thing you want is a jeweler with a lot of dissatisfied customers. One unique part about shopping for a ring versus other types of jewelry is that you’ll need to know her size. Determining ring size isn’t the same as eyeballing clothing sizes, either. If it’s just a tad too small, it could get stuck or be painful to wear. On the other hand, it could fall off if it’s a little too big. Although you can always take the engagement ring back to get sized, it’s cheaper and more convenient to get the size right on the first try. So, how can you find your girlfriend’s ring size? Well, there are two options. The first is to take your girlfriend ring shopping with you. The jeweler can get her size and you can get her opinions on rings you’ve picked out as possibilities. You can even retain the surprise by telling you haven’t gone ring shopping yet and nonchalantly pointing out the ring you were thinking of getting. You may want to wait a few weeks (or even months) before proposing to ensure you still give her the element of surprise! Your other option would be to swipe a ring from her jewelry box. However, each finger is a different size, so look for one that you see her wearing on her ring finger. Once the logistics are figured out, it’s time to focus on style. Take a look at the jewelry she normally wears. Does she have a lot of big, flashy pieces or is her jewelry more on the subtle side? If you’re feeling a little lost, consider taking pictures of her favorite jewelry and bringing it to the store. The jeweler may be able to suggest some rings that would match her style based on the pictures. Of course, you could always find a subtle way to ask her about her style or enlist the help of a friend or family member to give you advice. There are a few different factors you have to consider when choosing the right ring. While white gold is the most popular option today, it’s not the only one out there. Rose gold has been trending lately and yellow gold is expected to make a comeback. You can even get two-toned rings to add just a little color. Round diamonds have long been the most popular shape, but princess cut has been trending for a few years now. There’s also oval, pear, heart, emerald, Asscher, and cushion. With the metal type and diamond cut in mind, it’s now time to find the perfect setting. This is the band that goes around her finger and houses the diamond. Again, there are tons of different styles. You can find settings with diamond accents, halos, twists, vintage details, and more. You can even get a custom engagement ring to give her something truly one-of-a-kind. You’ve likely heard of the 4 Cs before—cut, color, clarity, and carat. 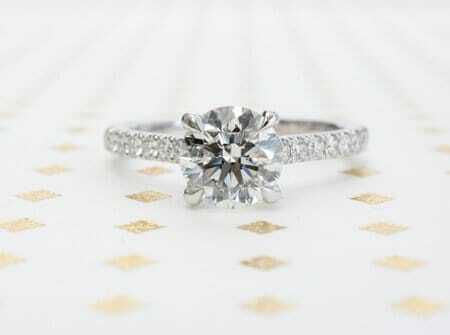 If you want to give her an amazing ring, be sure to pay attention to the quality of the diamond. While you won’t need a diamond that rates perfectly in any one category, you do want to opt for a higher-rated diamond if possible. You may be able to opt for a lower carat diamond if you’re using a setting with a halo or accent stones. It’ll still look sparkly and flashy but won’t cost you quite as much. Don’t pop the question with any old ring. 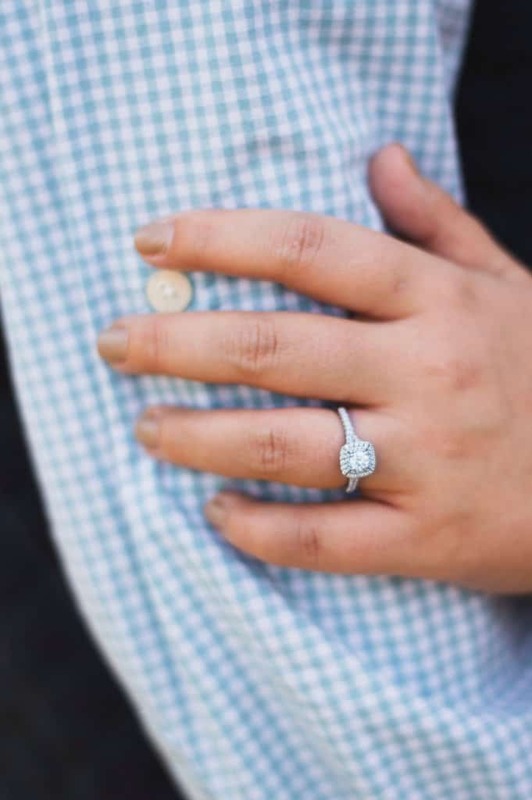 Make sure you learn how to buy an engagement ring by following the above tips, so your soon-to-be fiancee will have a ring she’s proud to wear for the rest of her life. Are you ready to start shopping? Contact us today to book a consultation with one of our ring experts.